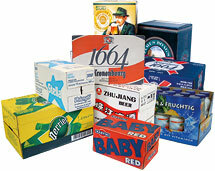 The packaging market is continually evolving and pays great attention to requests coming from markets in any country. Further to an increase in the demand for medium/low-speed machines, especially from emerging countries, SMI has enlarged its Smiflexi division's machine portfolio with the new LWP 25 wrap-around casepacker. The technological innovation developed by SMI for its high-speed packers has been applied to this new wrap-around machine as well, in order to offer high-quality packaging solutions at an affordable price. The new LWP 25 casepacker, which will be displayed at Emballage exhibition (Paris - France - from November 22 thru 25), meets production needs up to 25 packs/minute and boasts the same quality levels as Smiflexi division's medium and high-speed packers. The new LWP range is based on a continuous "wrap around" system and features a simplified modular design, which shortens not only the machine's assembly times but also its delivery schedule. The carton blank magazine is wholly situated beneath the infeed conveyour belt: a solution reducing machine encumbrance considerably and enabling it to be installed in packaging plants with limited available space. Thanks to a wide choice of accessories available, LWPs can be customised to increase base uses and satisfy the need for special applications. New LWP casepackers pack different container types in corrugated cardboard boxes or on corrugated cardboard trays in a ample choice of sizes. The LWP 25 has a motorised oscillating sorter, mounted on the infeed conveyour belt, which makes it easier to lane loose containers towards the product grouping point, thus making sure no brusque stops occur in feed flow. Product grouping and pack forming take place mechanically with a system which operates in an alternate manner. A synchronised separator bar receives products from the pneumatic separator, forms the desired pack collation and accompanies it to the tray/case forming unit, making the packing process more fluid and precise. Though manual, the pack size change is extremely simple and fast, as no mechanical or electronic part needs to be replaced. After manually regulating the different parts using specific reference counters and wheels to widen/narrow the product guides, the operator just has to select the desired pack collation on the POSYC control panel. Even going from small packs to large ones or vice versa creates no problems as the operator can easily change the machine pitch, which is identified by coloured position indicators on the chains. LWP wrap-around casepackers are managed and controlled by the POSYC operator panel, enabling operators to access machine manuals, update/modify operating parameters and monitor the entire packaging process. The graphic interface is really intuitive, the screen sensitive to touch and advanced diagnostic and technical support functions in real time on the POSYC guarantee that even the least expert operator can learn to use LWP 25 functions fast. Further information on the countless advantages of SMI's newer wrap-around casepacker are available at our stand at Emballage (Hall 4 - Stand 4D052). Otherwise we invite you to contact our sales department.